I took this picture with my phone this past week during the first ice storm that came through. This was the ice storm that came after the wind storm that knocked out our power for 24 hours, but before the snow storm that left us with around 4-5 inches of snow (for those of you who don’t live in the south, that is a devastating snow fall in these parts). As I write this, I am looking out at trees covered in ice from this morning’s freezing rain (resulting in cancelled church services). My family has had GREAT amounts of fun with this weather. We have sledded and built snowmen and made snow cream. The kids got to camp out in my room when we didn’t have heat, which they thought was really cool. We have enjoyed several weeks of a free schedule since so many of our activities have been cancelled due to the snow (even though, since we homeschool, school has NOT been cancelled, LOL). But we’ve had enough. A friend just posted this week’s weather report on my Facebook wall, calling for more snow and ice later in the week. I am not a happy camper. Will this winter ever end? I am dreaming of beach trips and pool days. Jason and Charlie spent the morning cleaning Charlie’s new golf clubs, thinking of afternoons spent on the golf course. Maddie and I just bought new shoes for warmer days. We are ready. I love this picture because it is a reminder from God straight to us. Winter will be over. And not just the season of winter, but the long stretches of winter in our lives. Those times when it seems we just can’t take anymore. Those days when the kids are throwing tantrums and the dog didn’t make it outside and the dinner is ruined, when people are sick and our plans are messed up, they will be over. 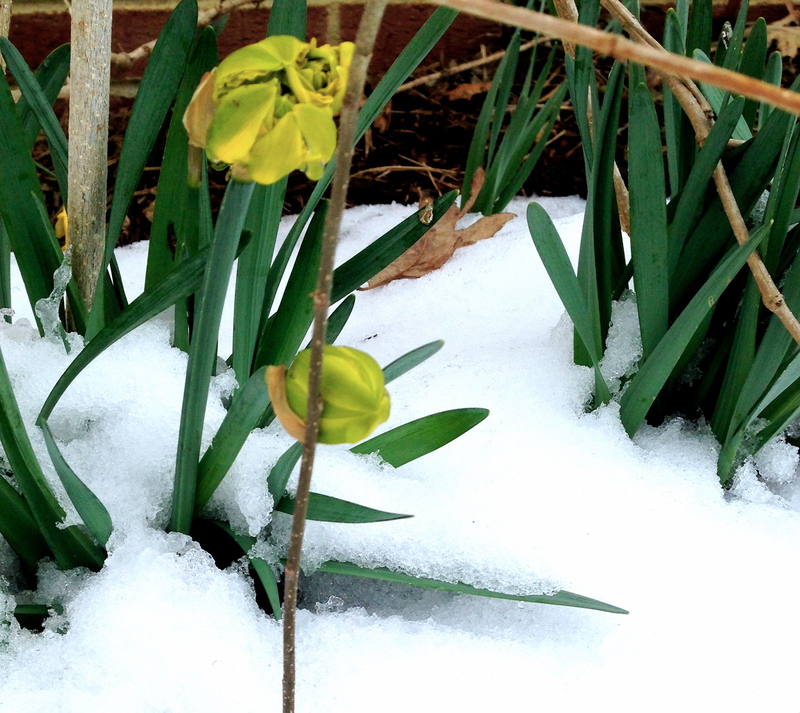 Like the beautiful flower in this picture that worked so hard to pop up through the snow and ice, we should persevere. This is how God is glorified and his beauty is shown to all people. Now remind me I said this when the storm hits this week! You can check out some more beautiful pictures on this topic here.